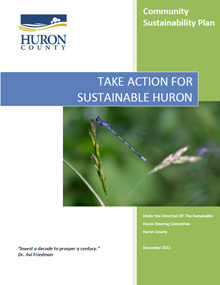 The Take Action for Sustainable Huron: Community Sustainability Plan outlines a broad, but connected range of visions, ideas and aspirations for what Huron County will be like in 2030. This report is based on input collected from hundreds of Huron County residents, organizations, networks and community leaders. It is a community document, made by the community. The full report can be downloaded from the link at the bottom of the page, or specific chapters are available for download, as outlined below. Definition of sustainability and why the County needs a plan for the future. Outlines goal to have healthy, resilient ecosystem and related project. Addresses maximizing energy conservation within County. Looks at how the County can sustain moderate population growth. Strategy to sustain and support valued community organizations and services. Ways to support and promote active transportation complementing residents’ lifestyles. Identifies strategy to develop an accessible, efficient, active transportation network within the County. Outlines project to preserve Huron County’s history and rural character. Describes means to encourage business retention and expansion within downtowns of Huron County. Strategy to continue to build support and momentum for local food. Looks at strategy to ensure Huron County is affordable and accessible for all residents. How priorities were identified; indicators and analysis of priorities and actions; and process for creating the plan. Lists strategies for achieving vision under three main pillars. For more information on the Community Sustainability Plan contact the Huron County Planning and Development Department by calling 519.524.8394 ext. 3.